Diane’s Kitchen Shop at Woodstock Hardware stocks one of the widest selection of quality kitchen products in the Hudson Valley. Learn more about Diane’s Kitchen Shop. So, if you are setting up an air B2B, a new apartment, or upgrading your own kitchen stop by Woodstock Hardware and check out Diane’s Kitchen, our fully stocked, gourmet kitchenware shop. Along with the 1000’s of kitchen items sold in Diane’s Kitchen Shop, Woodstock Hardware stocks a full line of small appliances for the kitchen and home. This includes standard small appliances such as; stand mixers, blenders, food processors, juicers, waffle makers, egg cookers, and also more unique and unusual appliances including; rice cookers, can crushers, and a dehydrators. You can even get an ice cream maker here! We also stock a wide range of small appliances for use in and around the home. So, if you are taking a trip and need a travel alarm clock, need a wall clock, or a hand or upright vacuum you can find it all at Woodstock Hardware. In addition to the selection of Small Appliances, Woodstock Hardware can also provide you the technical expertise required to help you make sure you will select the best small appliance to meet your needs. Here are a few tips on how to clean your automatic drip coffee maker. Fill the coffee maker’s water chamber with equal parts white vinegar and water. Using a paper filter, allow to brew until half the chamber is empty. Turn the coffee maker off and let it sit for 30 minutes, then finish brewing. Rinse the machine by using a new paper filter to brew a pot of clear water. Do this twice. Fill the carafe with warm, sudsy water and some rice as a gentle abrasive. Swirl the mixture in the pot, then use a scrubber sponge to remove any gunk. Rinse and dry. Wipe the outside of the machine with a damp cloth. 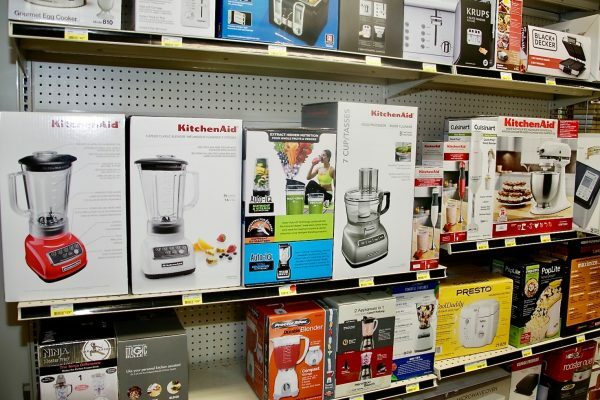 So, the next time you need a small appliance for your home, apartment, office, rental, job site, and even campsite, remember Woodstock Hardware has one of the widest selection, of small appliances in the area.